In October 2010, the Government of Canada elected to remove a long standing 25% import duty on vessels built in foreign yards and brought under Canadian flag. This duty had been put in place to protect Canadian shipyards from foreign competition but was becoming increasingly damaging to domestic shippers as more Canadian yards went into decline and bankruptcy or became unable to build new commercial vessels at economic costs. 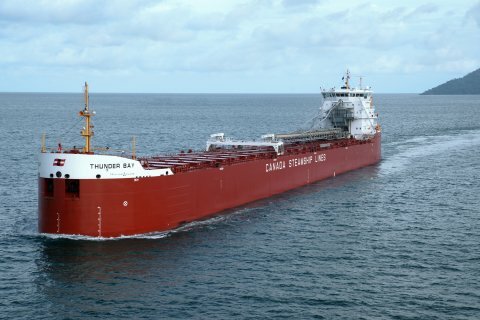 This duty remission combined with falling orders at Chinese shipyards and a high Canadian dollar proved to be the perfect environment for a long awaited Great Lakes fleet renewal program that ultimately translated into CSL’s Trillium Class program. The contract to build this new generation of self unloading lakers was awarded to Chengxi Shipyard of Jiangyin, Jiangsu China. The second of four nearly identical sister ships, Hull CX9302, was christened Thunder Bay (3) on June 11, 2012. After successful sea trials, the new vessel was delivered on May 25, 2013 and departed China on May 29 to begin her delivery trip across the Pacific, through the Panama Canal and on to Montreal QC. She successfully arrived at Montreal on July 21 where she stayed until July 30 having temporary hull strengthening removed that had been installed for the deep sea voyage, in addition to other minor modifications to prepare her for entering service on the Great Lakes. 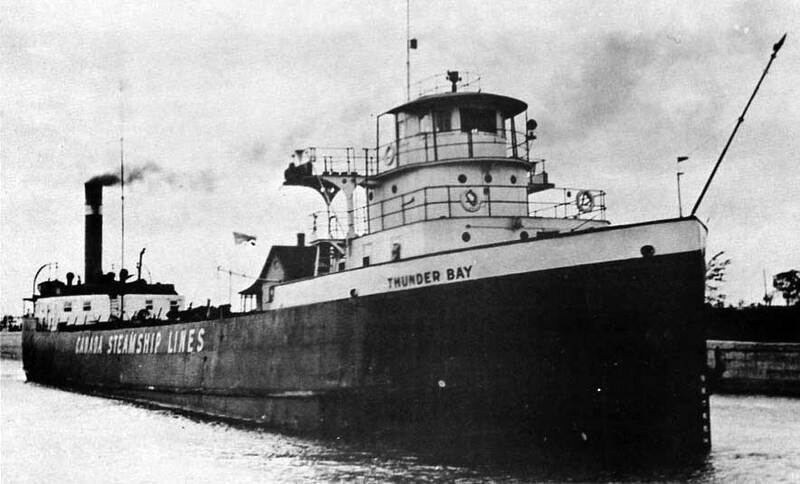 The name Thunder Bay has been associated with CSL since 1921. 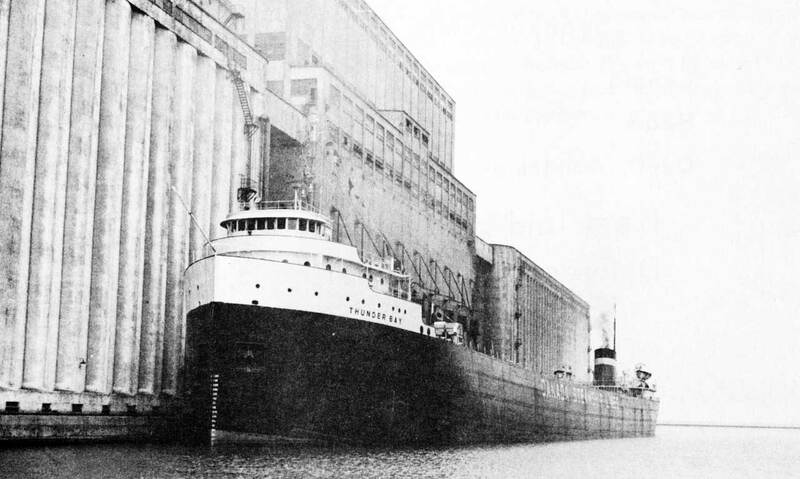 The first Thunder Bay was built by the Chicago Shipbuilding Co. in 1895 as the barge Malta for the Minnesota Steamship Co. She was acquired by CSL in 1921 and converted to a canal sized powered freighter by Davie Shipbuilding being renamed Thunder Bay. She served CSL interests until being sold to Marine Industries in 1940 and converted to the tanker Pinebranch. The Pinebranch did duty in WWII and was finally put to rest as a breakwater in Nova Scotia in 1960. CSL’s second Thunder Bay was a product of Port Arthur Shipbuilding Co., Port Arthur ON and entered service on November 24, 1952. This vessel measured 663-feet in overall length, 67-feet wide and 35-feet deep and was capable of carrying 17,600 tons at her maximum mid-summer draft of 24 feet 10.5 inches. Motive power was supplied by a Canadian Vickers 5-cylinder Skinner Unaflow steam engine rated at 3,600 IHP at 100 rpm driving a fixed pitch propeller that pushed her to a rated service speed of 12 knots. 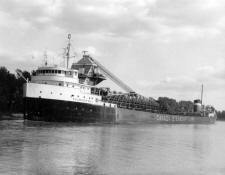 She was converted to a self-unloader by her builder during the winter of 1967-1968 and renamed Stadacona . Stadacona was an active member of the CSL fleet until she was retired at Toronto in 1991 and sold for scrapping in China a year later. 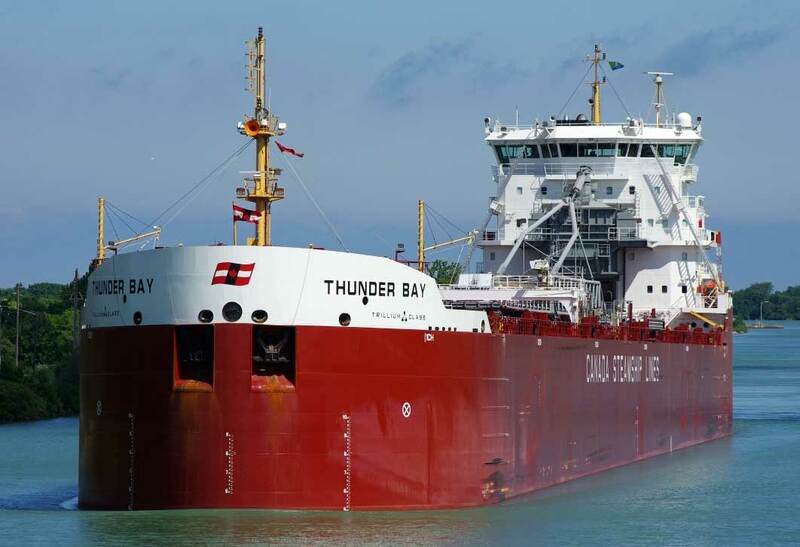 The new Thunder Bay measures 740-feet long by 78-feet wide and 48-feet deep. The self-unloader's 25 hatches feed into 5 holds where she can carry approximately 37,690 tons at the mid-summer draft of 29.5-feet. The vessel displaces 8,101 tons lightship. Her self-unloading equipment consists of a two-belt gravity fed system with a ‘C’ type loop belt elevator that feeds a stern mounted discharge boom that can unload at up to 5,450 tons per hour. Motive power is supplied by a single M.A.N B&W 6S50ME-B9 6-cylinder, slow speed diesel engine producing 8750kw or 10,680 BHP. Power is transmitted directly to a single controllable pitch propeller that can push her to a service speed of 13.5 knots. She is equipped with both bow and stern thrusters. The ship is upto 5 percent more fuel efficient than CSL's previous class of ships, and will save approximately 750 tonnes of fuel per year – amounting to yearly carbon emissions reductions of 2,400 tonnes. The Thunder Bay departed Montreal on July 30, 2012 on her maiden voyage on the Great Lakes system. Her first port of call was Windsor ON to unload a partial cargo of ballast stone that had been loaded in China for extra stability during the Pacific crossing. After a successful discharge, she proceeded upbound to Escanaba MI to take on her first paying load of iron ore for the transshipment facility at Quebec City. Entering the Poe Lock, she is upbound for Superior, Wisconsin.